First, this is not a picture of our refrigerator. 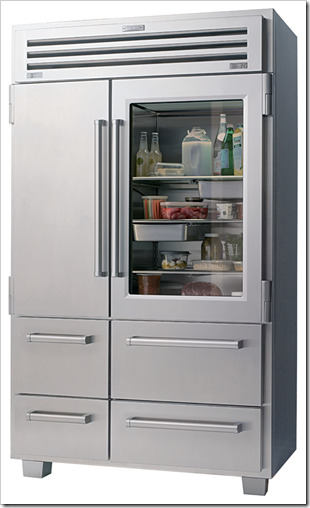 It's a picture of the refrigerator I dream about; it's a Sub-Zero Pro48 with a glass door- why was this not on Oprah's Favorite Things?! This post wasn't supposed to be about refrigerators...this post is about a game we play. When Cousin Kate and her husband were staying with us one weekend this summer they introduced us to the game called "New Ice." It's simple. When you hear the refrigerator's ice maker dump ice the first person to say "new ice" wins. It doesn't sound fun, but trust me it is. We're addicted to yelling "new ice" as fast and as loud as we can. (We both like to win.) Lucky for me my husband repaired our hand-me-down-old-school refrigerator's ice maker with a motor that's too powerful, which means our ice gets catapulted from within. It makes a loud shooting sound- like a gun. We can hear the ice maker torpedo ice out onto the inside of the freezer in all parts of the house. This morning I was up making coffee at 6:00 AM in a quietness, when the ice shot out with a bang, and then I heard my supposedly sleeping husband yell "new ice" from our bedroom. He wins 98% of the time. That's a good funny story. I can just see Kevo doing that!